Margaret of Austria was the daughter of Maximilian I, Holy Roman Emperor, and the grand-daughter of the last Valois Duke of Burgundy, Charles the Bold. She married Philibert II, Duke of Savoy (1480-1504) but was widowed at the age of 24. She then decided to build Brou Royal Monastery on the outskirts of Bourg-en-Bresse, to house three sumptuous tombstones (Philibert II’s, Philibert's mother’s, and her own). Appointed regent of the Netherlands in 1506 on behalf of father, and then on behalf of her nephew Charles V, Holy Roman Emperor, she oversaw the construction of the monastery from Belgium. She appointed some of the best architects and artists from across Europe to work on the build, and the work was completed in quick time (1505-1532). Brou Royal Monastery consists of monastic buildings, based around a church and three cloisters. The church is a masterpiece of flamboyant Gothic architecture, and is the only one of its type in France (by virtue of its Brussels style). It is instantly notable for its remarkable roof with glazed, Burgundy-style tiles. Inside, visitors will note its sumptuous and exceptionally well preserved décor. It features a range of sculptures, stained-glass windows, stalls and one of the few preserved rood screens in France, as well as the monumental gravestones of Margaret of Austria, Philibert II and his mother, Margaret of Bourbon. The delicate stonework features the hallmarks of ostentatious, flamboyant Gothic styling, with ribs, alcoves, ridges, arcatures, decorative archivolts and curved cabbage leaves forming an exceptional example of pre-Renaissance art. The monastic buildings were constructed to house Augustinian monks, whose duty was to pray for the princes buried in the church. Visitors will admire the size and beauty of the three cloisters, with low and high galleries, the vast chapter houses, the refectory, and the old kitchen complete with vaulted beams. The tour continues on the first floor, featuring spacious rooms that now play host to a museum of fine and decorative art. Brou Royal Monastery offers a range of tours, workshops and courses for members of the public, covering art, archaeology and architecture. It also hosts temporary exhibitions of ancient and contemporary art, as well as a series of live performances each summer as part of the “À la folie... pas du tout” festival. 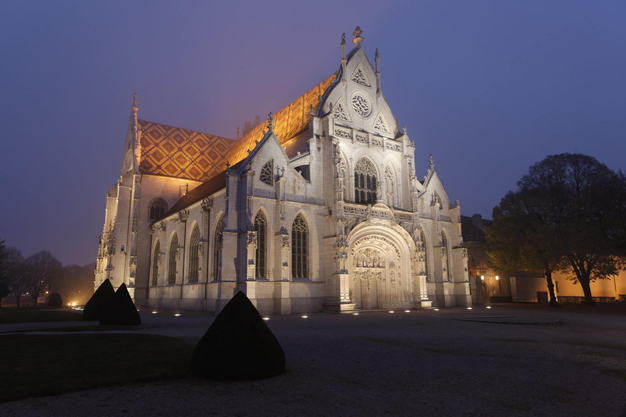 Brou Royal Monastery is managed, preserved, promoted and coordinated by the Centre des monuments nationaux and Bourg-en-Bresse Council.